The Amazon threat still hangs over many bricks-and-mortar retailers, but the coming holiday season should be a happy one for most, according to projections from the National Retail Federation. The NRF said Wednesday it expects retail sales in November and December—excluding automobiles, gasoline and restaurants—to increase between 4.3% and 4.8% over the year-ago period, or to about $717.5 billion to $721 billion, says NRF chief economist Jack Kleinhenz. The sales rise projected compares with an average annual holiday season gain of 3.9% over the past five years. Additionally, retailers have been preparing for their busiest season of the year by hiring extra staff to help meet the demand expected during the coming holiday season, despite an increasingly tight labor market, the NRF said in a press release. The national retailers’ trade organization says it expects temporary hiring of between 585,000 and 650,000 workers in this period, up from last year’s 582,500 in November-December. The NRF forecast reflects the overall strength of the industry, he says, thanks to a healthy economy and strong consumer confidence. “It’s consistent with the strong economic growth we have seen in the last couple of quarters,” he adds. There’s “solid momentum” in the fourth quarter and most retailers will see improved sales, he says. NEW YORK (Reuters) – U.S. holiday sales in 2018 will increase 4.3 percent to 4.8 percent boosted by a strong economy but will be slower than a year ago when consumer spending surged to a 12-year high, according to a forecast from a leading retail industry group. The National Retail Federation (NRF) said holiday sales growth will be higher than an average increase of 3.9 percent over the past five years but slower than the 5.3 percent growth witnessed a year earlier when consumer spending grew the most since 2005 and was boosted by tax cuts. “Last year’s strong results were thanks to growing wages, stronger employment and higher confidence, complemented by anticipation of tax cuts that led consumers to spend more than expected,” NRF Chief Economist Jack Kleinhenz said. “With this year’s forecast, we continue to see strong momentum from consumers as they do the heavy lifting in supporting our economy,” he said. The combination of more jobs, improved wages, tamed inflation and an increase in net worth all provide the impetus to spend, he added. The trade body also said there are continued concerns about an escalating trade war with China but it is optimistic about consumers’ propensity to spend. The retail trade group said it expects sales for the last two months of the year between $717.45 billion and $720.89 billion, excluding autos, gasoline and dining out. Holiday sales in 2017 were $687.87 billion. NRF’s forecast is one of the most closely watched benchmarks ahead of the holiday season, when retailers like Amazon.com Inc, Walmart Stores Inc and Target Corp generate an outsized portion of their profits and sales. The last two months of the year can account for 20 percent to 40 percent of annual sales for many retailers. The NRF forecast follows other estimates from companies like AlixPartners, which says sales will grow in between 3.1 percent and 4.1 percent as “2017 will be a tough year to follow.” Forecasts from companies like Deloitte and PwC expect holiday retail sales to grow around 5 percent. NRF also said Wednesday that it expects seasonal employment by retailers to reach between 585,000 and 650,000 jobs, up from 582,500 in 2017. The forecast underscores the message from many retailers that the brisker sales they’ve reported in recent quarters are not a fluke. Shoppers spent $687.87 billion on purchases during last year’s holiday season, a 5.3 percent bounce over the previous year, and the biggest bump since 2010. National unemployment stands at 3.9 percent, close to an 18-year low. “The combination of increased job creation, improved wages, tamed inflation and an increase in net worth all provide the capacity and the confidence to spend,” said Jack Kleinhenz, NRF’s chief economist. Americans are spending more than expected this holiday season, fueled by income gains, confidence in the economic outlook, buoyant financial markets and modest inflation. The boost includes in-store and online spending at brick-and-mortar retailers such as Wal-Mart Stores Inc. and Nordstrom Inc., which clocked the largest year-over-year November sales increase in seven years. Home-furnishing stores and electronics-and-appliance stores also logged strong spending numbers, despite competition from online-shopping websites, which also posted robust gains. Altogether, sales at online retailers, brick-and-mortar stores and restaurants rose 0.8% in November from the prior month, well above the 0.3% increase economists surveyed by The Wall Street Journal had expected. That was up 5.8% from a year earlier, the largest yearly November increase since 2011. Despite their woes from online competition, general merchandisers such as department stores fared well, registering a 3.6% sales increase from a year earlier, the best November performance since 2010. Taken altogether, the data suggest the U.S. is on track for robust growth in the fourth quarter. Macroeconomic Advisers, a forecasting firm, estimated the economy is growing at a 2.8% annual pace in the October-to-December period, up from a 2.6% forecast before the retail-data release. The Federal Reserve Bank of Atlanta estimated a 3.3% growth rate. One caveat: Spending is so strong it is outpacing income gains, meaning Americans are saving at a slower rate, which could lead to a spending slowdown later or the threat of rising debt levels. 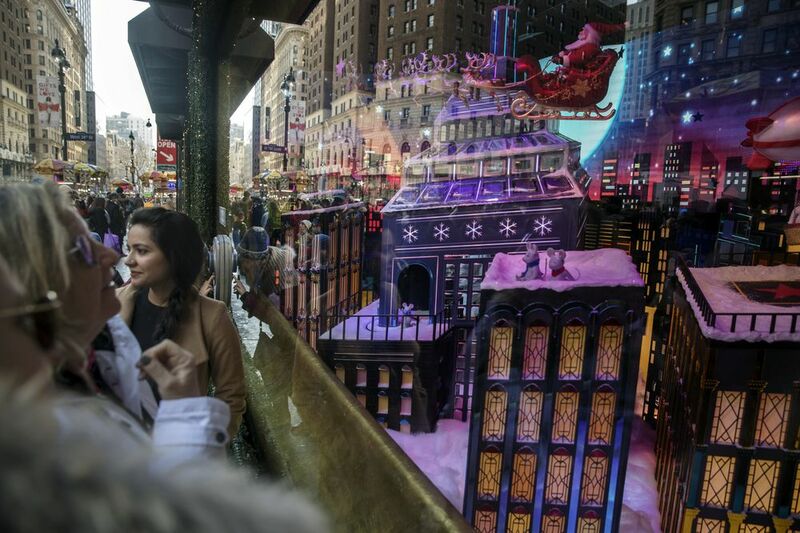 Spending comparisons to last year were boosted by a weak holiday season in 2016 for retailers, which were plagued by high inventories and a slowdown in purchases by international tourists amid a rising dollar. This year, some brick-and-mortar stores appear to be better managing their inventory. In their most recent quarter, both Macy’ s Inc. andKohl’s Corp. said their stores had less excess merchandise to clear out at steeply reduced prices. “We don’t have the albatross of a lot of extra inventory like we did last year,” Macy’s Chief Executive Jeff Gennette said in an interview on Black Friday. That, in turn, resulted in less discounting, Mr. Gennette said. Mr. Kleinhenz said increasingly sophisticated website and app advertising is helping brick-and-mortar retailers too. “It’s a combined strategy that retailers have developed that integrates the use of the internet with the brick-and-mortar shopping approach,” he said. The retail industry is undergoing another major shift — to e-commerce. How did we get here? Since Nov. 1, online revenue has risen 24% compared with the same period last year, said Slice Intelligence, a research firm that tracks online purchase receipts. Online sales at Target Corp. ,Kohl’s Corp. and Costco Wholesale Corp. rose the fastest, the firm said, though Amazon continued to grow rapidly from a larger sales base. Better-than-expected quarterly results were reported by some mall stalwarts that have been battered, including Macy’s Inc. and Gap Inc. “There is a consolidation taking place” in the apparel market, Gap CEO Art Peck told analysts on Nov. 16. “Almost regardless of consumer sentiment, we’ve got an opportunity to drive growth and gain market share,” Mr. Peck said, as the company closes stores, remodels others and speeds up its product pipeline. The closure of thousands of stores this year could be giving those left standing a boost. “On an overall basis, a portion of our improvement in our sales trend is attributable to our targeted efforts to capture share from competitive store closures in some of our trade areas, and we expect this will continue, if not accelerate, through the holiday season,” Kohl’s CEO Kevin Mansell told analysts in November. Some businesses, meanwhile, are feeling a boost from the stronger labor market. Pete Benck, owner of Madison, Wis.-based vintage clothing store Good Style Shop, said this holiday season’s business has been stronger than last year’s. “We have had a lot of foot traffic, and I think there’s a lot of confidence in our consumers lately,” Mr. Benck said. The National Retail Federation expects consumers nationwide to spend about 4% more during the holiday shopping season than they had in 2016. That would make 2017 the strongest holiday season since 2014. Mr. Kleinhenz said the U.S. appears to be on track to meet that goal. —Sarah Nassauer contributed to this article. With consumer spending surging, retailers are hoping for something they haven’t seen since the last recession began a decade ago: a truly great Christmas. 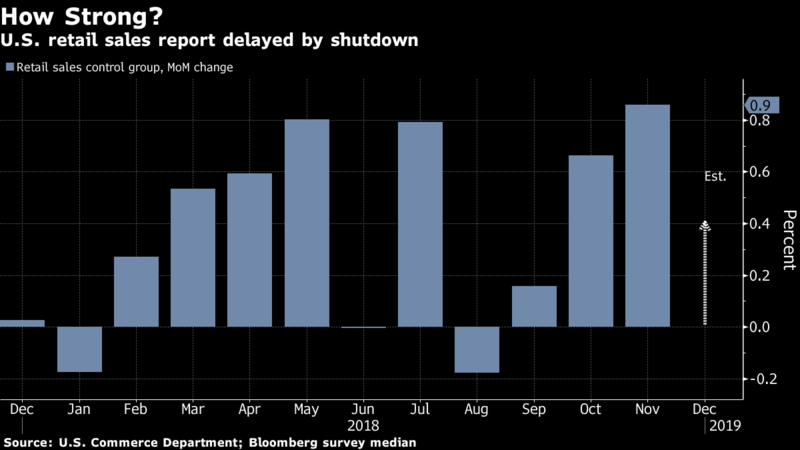 The Commerce Department reported better-than-expected U.S. retail sales for November and revised its October figures upward, bringing a fresh wave of optimism to a long-embattled industry. Holiday shoppers are snapping up Nintendo Switch devices and Fingerlings toys as their disposable income grows, according to Craig Johnson, head of the Customer Growth Partners. His research firm just boosted its forecast for holiday sales to 5.6 percent, well above the 4.3 percent it had targeted earlier. “We think this marks the beginning of a real and sustained rebound,” Johnson said in an interview. After tracking the 50 largest retailers across 90 major shopping venues, he believes that spending will grow more this season than in any holiday since before the Great Recession began in 2007. “It’s all demographics, and it’s geographically widespread,” he said. Austin Kreitler, a 21-year-old college student in New York, is one shopper who is ready to open his wallet this holiday season. The spending uptick is good news for retailers of all stripes, but some are faring better than others. Online spending growth is expected to outpace brick-and-mortar expenditures, and plenty of companies are still struggling. Pier 1 Imports Inc., the home-furnishings chain, saw sales weaken in the first two weeks of December. The slow start to the holiday season weighed on the company’s fourth-quarter forecast, sending the shares on their worst rout in almost three years Thursday. Traditional retailers are increasingly chasing online dollars. Wal-Mart Stores Inc. has acquired web brands such as Jet.com and Bonobos, and it’s offering two-day free delivery to entice shoppers. Target Corp., meanwhile, agreed to buy e-commerce startup Shipt Inc. this week for $550 million, aiming to challenge Amazon.com Inc. The greater emphasis on online orders may be one reason why a rosier holiday season isn’t translating into traffic gains at many malls. During Black Friday, foot traffic was down slightly for the second year in a row, according to data compiled by Prodco Analytics and Bloomberg. Genevieve Domingo, a shopper who was trying on boots at Bloomingdale’s, said she’s getting most of her gifts online this year, including a Game of Thrones drinking horn and a DNA kit for her brother. Merchants without physical stores saw their biggest sales gain last month since October 2016, the Commerce Department reported on Thursday. But retail growth was broad-based, with 11 of 13 categories posting increases. Apparel sales had their third straight uptick, the longest such stretch since mid-2014. The numbers indicate that household spending, which accounts for about 70 percent of the economy, is picking up during the final stretch of the year. The job market remains strong, with solid hiring and an unemployment rate that’s the lowest since December 2000. In addition, stock-market gains and rising home values are boosting household wealth. If this season’s sales reach Customer Growth Partners’ target, it would be the best holiday performance since 2005. The industry posted a 6.1 percent increase that year, when the economy was still booming and a red-hot housing market was fueling spending. One wild card is the tax bill wending its way through Congress. The legislation promises to to lower the burden for households by doubling the standard deduction, but consumers who can’t withhold as much of their state and local taxes could lose some spending power. The National Retail Federation, the industry’s biggest trade group, has argued that consumers are spending more this season because they anticipate a tax cut. About 174 million Americans shopped during the long Thanksgiving weekend, 10 million more than expected, the organization said. This year, some brick-and-mortar stores appear to be better managing their inventory. In their most recent quarter, both Macy’s Inc. and Kohl’s Corp. said their stores had less excess merchandise to clear out at steeply reduced prices. “We don’t have the albatross of a lot of extra inventory like we did last year,” Macy’s Chief Executive Jeff Gennette said in an interview on Black Friday. That, in turn, resulted in less discounting, Mr. Gennette said. Since Nov. 1, online revenue has risen 24% compared with the same period last year, said Slice Intelligence, a research firm that tracks online purchase receipts. 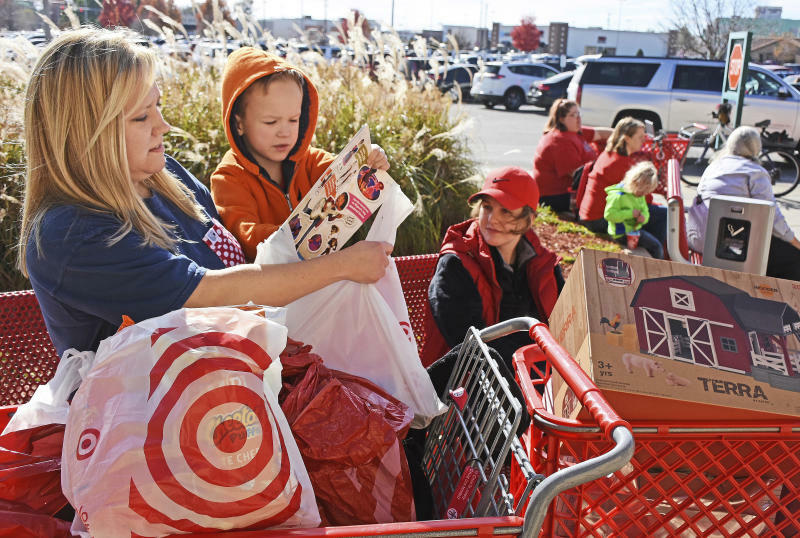 Online sales at Target Corp., Kohl’s Corp. and Costco Wholesale Corp. rose the fastest, the firm said, though Amazon continued to grow rapidly from a larger sales base.